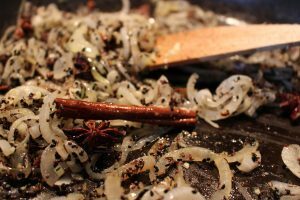 In a small frying pan fry the onion on quite a high heat, you want the onion to start browning a little bit as it adds flavour to the rice. Turn the heat down and then add minced garlic and ginger, taking care not to burn them as they will become bitter. In another frying pan, dry roast the cinnamon, cloves, cumin seeds, cardamom pods and star anise. When fragrant add to the onion mix and stir well. Season with salt and pepper. In a small jug dissolve the stock cube in 200ml boiling water, mix in the coconut milk and then and set aside. Rinse the rice well by adding to a pan or bowl full of cold water and swirling the water and rice around. Drain the rice then wash again with more cold water repeating this process until the water from the rice runs clean. This eliminates most of the starch and will stop your rice from being gloopy. Take a large pan and add the onion and spice mix to it then the rice and then add the coconut milk and stock mix. 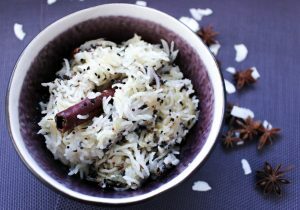 Add some ghee or coconut milk, bring the rice to a boil then reduce the heat to a low setting, cover the rice with a tight fitting lid and cook for 20 minutes. Take the rice off the stove and set aside to steam for a further 5 minutes before serving.